Did you know that the majority of local locksmiths are also uPVC specialists? Whatever situation you are in it can be extremely stressful to find that your uPVC door or window is not functioning correctly. This can not only be stressful but can be a high risk to the security of your home, especially if the uPVC door is jammed in the locked or unlocked position. This can be due to various factors, including the sudden change in the weather or basic wear and tear. Any issues with a uPVC door should be rectified as quickly as possible as you may be subsequently vulnerable to a break in and failure to get the uPVC door repaired could result in invalidating your home insurance policy. 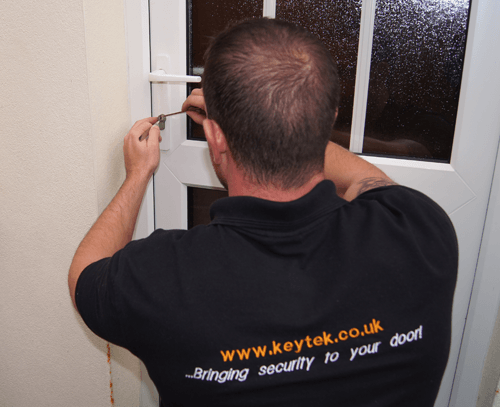 Here at Keytek® all our Locksmiths are fully trained and skilled in uPVC doors and windows. A quick call to Keytek® on 0800 035 0451 and we will have an engineer on site and nine times out of ten are able to resolve this issue on the first visit. – The BS3621 signifies that a lock has been tested by the British Standards Institute and has met all of the relevant standards. It is widely recognised by the public and the majority of UK insurers as a sign of quality. – The key operated part of most locking systems. Available in many formats such as Euro profile, Rim type and Oval. – A cylinder specifically designed to help prevent cylinder or lock snapping. The ABS High Security Euro Cylinder is the only security cylinder currently on the market which has a TS007 3 star rating, SS312 Sold Secure Diamond Accredited and Secured by Design Accreditation combined. – A solid bolt that protrudes from the Forend of the lock into the ‘Keep’ fitted on the door frame. – A function that offers an extra locking facility on top of the standard operation. – Any hardware fitted to a door other than the lock itself. Handles, door knocker etc. – Similar in principal to dead bolts, although for added security hook bolts pivot out of the case and swing up or down into the frame. – Usually found used in conjunction with a number of other locking points (such as deadbolts). – A square bar that runs between two handles, passing through the lock body itself to allow the latch to be retracted when a handle is operated. – A euro profile cylinder in place of the internal Key way to allow easy or quick egress. – Small round lugs that are drill into the spine of a door and engage into keeps in the frame when the door is closed. Designed to prevent a door being lifted from its hinges and removed unless open. – More than one lock manufactured in sequence or to a specific non-random pattern. Master Key – A key that is designed to be able to open more than one lock.